Handing out branded pens as a gift at corporate events, exhibitions and conferences is a smart move for your business: not only can you print your logo on them; they are a useful item that recipients will likely use again and again - constantly promoting your business. 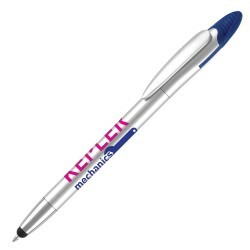 While printed pens are one of the most basic promotional items available, innovation into print processes, areas, grips and shapes means that as a brand there are so many options available! 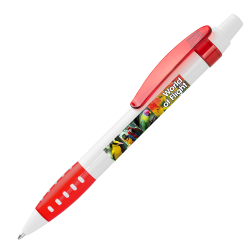 We can now print budget plastic pens with full colour artwork in smaller batches, laser engrave your logo onto different parts of the pen body and more! 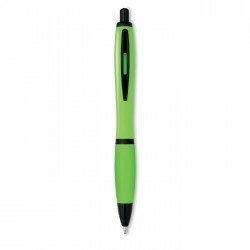 Most branded pens on the market are made from a variety of different plastics. 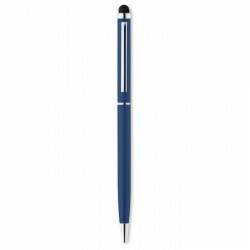 In this range, we offer a range from our European partner factories available branded from an incredibly low minimum order quantity, so if you're only in need of 100 pens, we're the place to go. 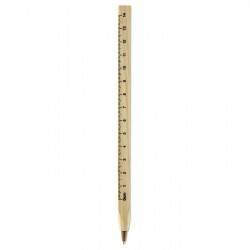 We've separated out our budget section, which includes pens available at short lead times from our UK warehouse stock. 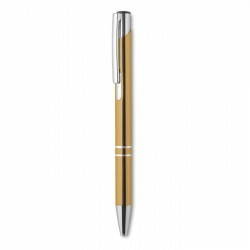 This range has some of the most popular promotional pens on the market today - the Absolute, Alaska and Contour range. 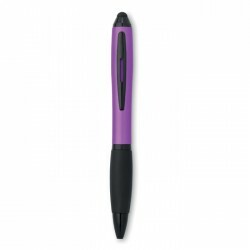 These pens are great to write with and perfect for schools, universities and anywhere where basic, functional products will be appreciated. 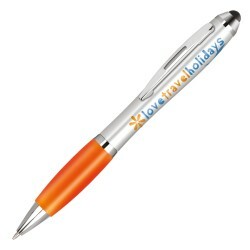 For a budget giveaway at any event, these pens are a stalwart - customers can grab a fistful, give them away to their friends, kids or use them around the house. 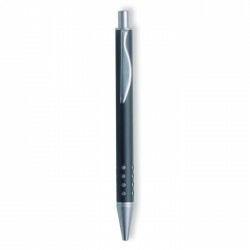 For customers that prefer a weighty feel to their writing instruments, metal pens offer a tactile experience and can be branded with laser engraving for an additional premium touch. 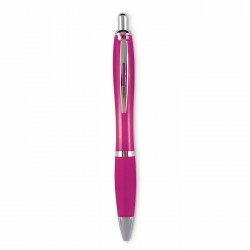 Many of these pens are also available with stylus tips, so they'll work with iPhones, Androids and all manner of touchscreen devices - perfect for those chilly days where gloves don't allow you quick access to a smartphone. 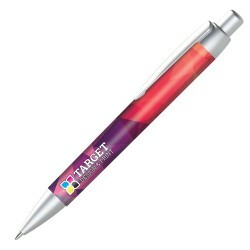 In the past, full colour would be difficult to achieve as many pens are printed in bulk using a screen print process. With upgrades in machinery, processes and technology, we can now offer printing in any range of colour from lower quantities and at lower prices than ever before. So don't worry if your logo contains gradients, overlaid imagery or hard-to-print areas, our full colour selection will do the trick. 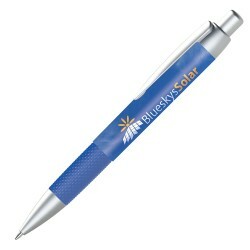 Naturally, many promotional products cater towards budget giveaways, purely to aid visibility. However, for the gift market, there are many luxurious options available, fit for any CEO or executive as a long service award, at an end of year review, or just as a thank-you. They are typically much heavier weight, with a smooth writing style and good balance. This section works well for the gifting market - our pen and pencil sets come in a wide variety of shapes, colours and options. 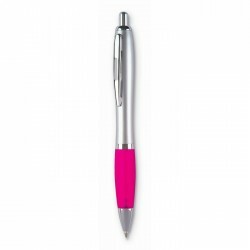 We offer a range of pens for you to pick from: click pens, highlighters, ball pens, corporate pens and more.. All waiting for you to customise with your branding! Browse our full range below. Our number one aim is to never let a customer down: we want to ensure you’re happy when you order with Printkick, and this includes everything from initial designs, to prices and delivery. Our expert team of staff are only a phone call or email away and will be happy to answer any questions you may have. We’re extremely proud of our 4.8/5 score on Feefo, and we’ll continue to work hard to ensure you enjoy your experience with us. We don’t see the point in negotiations back and forth with sales people when it comes to pricing. Instead, we wanted to ensure our quotes were clear and simple. Once you’ve selected the promotional pens you’d like to order with us, we’ll provide you with a quick quote, that’s valid for the duration of your visit to our site. We don’t charge crazy amounts either - all of our products are all budget friendly. When you’ve ordered your corporate branded pens, the last thing you want is to have to wait weeks to receive them. The majority of our standard items can be screen printed in five working days, and we’ll send you an automated update when your order is out for delivery. 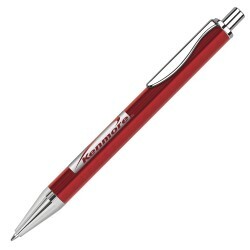 Yes, handing out branded executive pens at exhibitions is really useful, but there are so many more products you can add your company’s logo too, as well. It’s not just stationery we offer: you can purchase everything from mugs to keyrings, confectionery to USB flash drives and so much more. 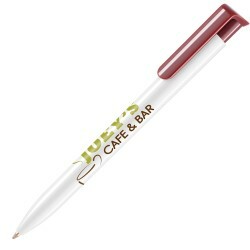 Just take a look at the rest of your website and see what else you could hand out at your next corporate event.